Only a while back, Honda was named the 'Preferred Sedan Car Brand of the Year' and that too for the fourth year in a row. 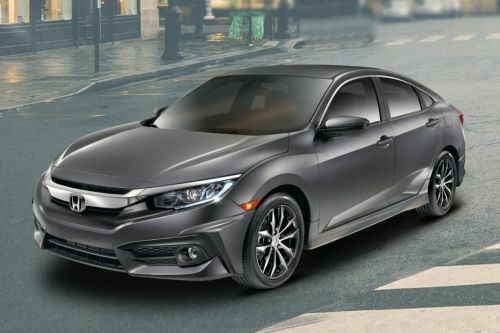 And part of the said achievement credit goes to the Civic that with its sporty design, best-in-class fuel efficiency, and high comfort level have earned the company a good name. The currently on-sale Civic carries an upmarket feel in terms of styling and design. The cabin too is loaded with features, all aiming at making the journey comforting for passengers. In the UAE market, the Civic is offered in three engine options - a 159 PS 2.0-lire, 181 PS 1.5-litre, and lastly the newest addition, the 124 PS 1.6-litre. All the trims are offered with a CVT unit, with no manual option at the service. With a starting price of AED 69,900, the Civic is one of the best options available in the segment. Plus, it comes with a plethora of safety options. Civic is available in 1 different colors - Gray. Since its launch in the early 70s, Civic has managed to gain appreciation in its almost every generation. Now in its 10th generation, the 2018 Civic has managed to repeat its legacy. Through its many iterations, it has seen many changes in the car market. The Civic has adapted itself to these changes but largely stayed true to its recipe for affordable practicality and economy. Today it competes against cars like the Toyota Corolla, Hyundai Elantra and the Mazda 3. In light of increasing competition, it went under a rather drastic overhaul in 2017. Its engine choices were also expanded. The 2018 version is largely unchanged from that. While the UAE only gets the compact sedan model, it also comes in the guise of the coupe, the touring and the hot hatch version overseas. The interior is usual Honda mix of quality and ergonomics. The greenhouse accommodates a good view of the outside. The lowered seats may be taxing on some knees. Additionally, they can only be adjusted for fore-aft and recline. Some lumbar support adjustability would have helped here a lot. The driver gets a chunky three-spoke steering wheel with audio and cruise control buttons. The interior is two-tone with a balancing act of silver and black. The quality of the switchgear is decent but does tend to be on the cheaper side. Seats are covered in scruffy looking cloth upholstery. The Turbo does get leather seats though. The rear suffers from leg room issues and reduced headroom because of the swooping roof. Dual zone air conditioner is also available only on the higher variants. Noise levels are decent with the CVT making itself known at higher revs. In-cabin storage is aplenty with many well designed and ergonomic cubbyholes and cup holders. They are also removable and customizable in some brilliant ways. Cargo space in the trunk is massive at 15 cubic feet but again suffers because of its coupe-like design. The floor is not entirely flat because it needs to make space for the exhaust. There are however 60:40 fold down seats in the rear. The Civic comes to UAE in its compact sedan avatar. The 2017 version received some very drastic changes in its design. At 4630 (L) x 1799 (W) x 1416 (H), it is longer and wider than the previous versions. The seating position also goes lower by 20 mm. All these changes together give a more planted feel and better driving dynamics. Outside, the car gets a swooping coupe like roofline. This swooping roofline would have otherwise compromised the headroom but the lowered seating position helps somewhat. The front gets a low sporty hood, flanked by angular haunches. The front grille has a lot of sporty touches especially the thick chrome lip and the swanky DRLs. But it might be too busy for some. A black lip instead of the chromed one may better suit these people. The front and rear bumpers get huge pentagonal intakes. The rear is arguably the best-looking angle overall, with its curved taillights hugging the rear haunches. The side profile is accentuated by strikingly designed rear view mirrors, long cuts, and two-tone 16-inch stylized alloys. In summation, this Civic is not a shrinking violet. You will attract some looks on the highway. There are three engine options to choose from. The cheaper DX and the LX Sport get a 1.6-litre SOHC inline 4 that produces a maximum power output of 123 hp at 6500 rpm and peak torque of 151 Nm at 4300 rpm. The more expensive EXI, gets a 2.0-litre DOHC 16-valve inline 4 producing 158 hp of power at 6500 rpm and 187 Nm of torque at 4300 rpm. The most powerful of the three is the 1.5-litre turbo in the RS Turbo variant. At its peak, it churns out 180 hp at 6000 rpm and 220 Nm of torque between 1700 and 5500 rpm. The naturally aspirated 1.6-litre variants are here to appease the frugal-minded customers. The 1.5-litre turbo is for the power hungry while the 2.0-litre is for the more middle of the road customer. All these engine options are mated to smooth and predictable, continuously variable transmission with no option for the slick manual. Since the Civic buyer will be most concerned with economy we will focus on the 1.6-litre unit. Torque is available low down in the rev range and allows sub 11 sec 0-100 kmph times. It also claims a fuel economy of 18.5 kmpl, which is great for a compact sedan. All variants get a remote engine starter, sporty pedals, pedal shifters and electronic parking brake. Safety has been given a high priority. The same level of safety equipment is standard across all variants. Except for the missing side airbags and the multi-angle rear camera in the two cheapest variants, the rest is standard. These include anti-lock brakes, brake force distribution and a tire pressure monitor. Driver aids in the form of traction control, hill start assist, handling and stability assist are also present across all variants. There is also an emergency stop signal and a brake override system when things get out of hand. Keeping the majority of the safety equipment standard across variants is a very welcome move that needs to become standard across manufacturers. On road prices of Honda Civic in starts from AED62,895 for base variant DX, while the top spec variant LX Sport costs at AED73,395 . What are the colors options available in Honda Civic?